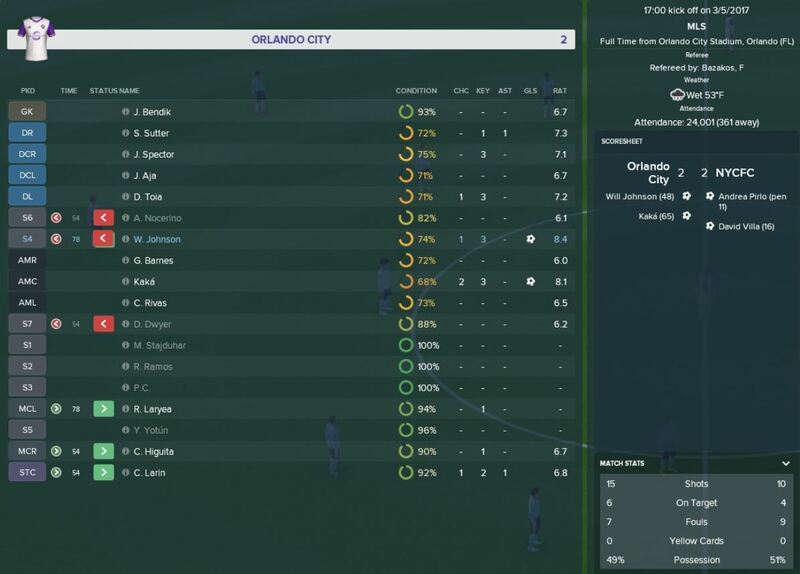 Here is post #2 from the ongoing series recapping this technological autopsy of the Orlando City 2017 season by replaying it through Football Manager 2018. You can read about the beginnings here, and the simulated pre-season here. As we relive the Orlando City 2017 MLS season, few nights are more memorable than the tight match-up with former expansion rivals NYCFC to open up the brand new Orlando City Stadium. The game itself was memorable for me on a very personal level as my fellow supporters and I took to the stands for the first time in our new home. I can still remember that bit of vertigo I felt walking to the rafters of section 120 for the first time. The steepness of the stands creates the impression that despite how high up my seats are, you are still relatively close to the field. Forgive me for my reminisces, let’s get down to the business at hand. Rebooted Orlando City took on NYCFC to start off the season and officially started this experiment in trying to understand what went so wrong for the Lions this past season. NYCFC went up early on a Pirlo penalty kick in which digital Joe Bendik chose poorly. The Citizens followed that up with a very David Villa-esque goal by David Villa. The home team looked to be in all sorts of trouble until a goal early in the second half by Will Johnson woke the Lions up. It was a Rivas to Larin to Kaka link-up that knotted the score at 2-2. A scoreline that would stick until the end of 90 minutes. The Orlando City performance wasn’t one to behold, but maybe the right kind of game to get a team moving in the right direction. I recall saying nearly the same thing when Orlando edged out NYCFC 1-0 in the real version of this fixture. Orlando created a good number of shots on goal and held their own in possession, two positive signs. The performances of Dom Dwyer, Giles Barnes, and Antonio Nocerino were all a bit concerning. The FM18 NYCFC feel a little more dangerous than real life, as all the talent represented in raw data seems to gel in a way they didn’t in the real life fixture. If you have a look at this heat map you’ll notice a glowing red spot where David Villa was so comfortable in front of the Orlando goal he should owe my digital club a rent check. 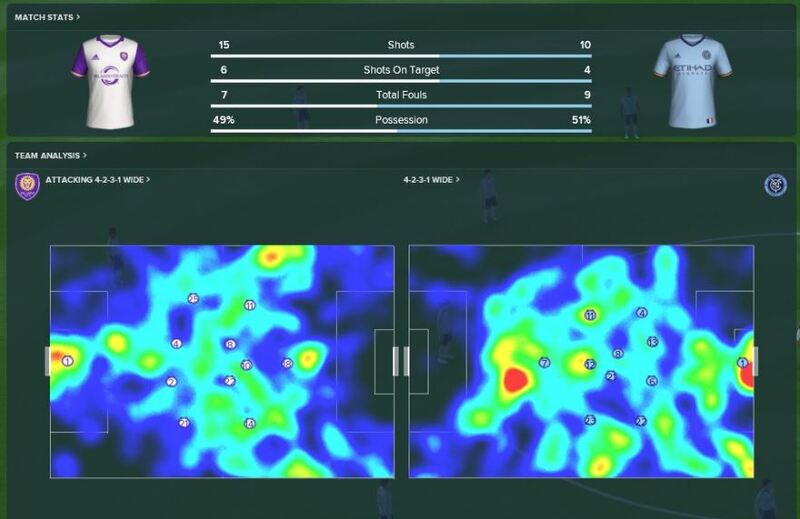 Orlando’s heat map (left) looks a bit cold. Despite the second-half effort, I feel lucky to have walked away from this one with a point. Onward, with Philadelphia Union coming up at home, then Columbus (#SaveTheCrew) away, Red Bulls at home, LA Galaxy at home, off to NYCFC to see if FM18 breaks trying to simulate soccer on a baseball diamond, and then Colorado at home to wrap up the month. Interesting to see where all this is going to go.